A study published this month and authored by self-described "critical race scholar-activists" Katie Ishizuka of The Conscious Kid Library and University of California PhD student Ramón Stephens dives into such allegedly problematic and racist facets of Seuss and his work. The study is aptly titled, "The Cat is Out of the Bag: Orientalism, Anti- Blackness, and White Supremacy in Dr. Seuss's Children's Books." As noted by The College Fix, Ishizuka and Stephens "interpreted the late author’s works as 'dehumanizing and degrading' to 'Black, Indigenous, and People of Color (BIPOC), and people from other marginalized groups (including Jewish people and Muslims),' largely because non-white characters were illustrated in stereotypical fashions, they argued. They also claimed the books included 'white savior' heroes as well as dehumanized characters of color. The study found Seuss ... published 'anti-Black and anti-Semitic cartoons' and 'sexist depictions of women.'" White supremacy is seen through the centering of Whiteness and White characters, who comprise 98% (2,195 characters) of all characters. Notably, every character of color is male. Males of color are only presented in subservient, exotified, or dehumanized roles. This also remains true in their relation to White characters. Most startling is the complete invisibility and absence of women and girls of color across Seuss’ entire children’s book collection. The study’s authors, however, are unimpressed: “Seuss never issued an actual, explicit, or direct apology or recantation of his anti-Japanese propaganda or the calls he made to ‘kill Japs!’” they said. But, as highlighted by NPR, in 2017, the National Education Association “rebranded” Read Across America, which included a distance from Seuss’ books and “Seuss-themed activities.” Instead, the organization “introduced a new theme of ‘celebrating a nation of diverse readers.'" Will the idiocy ever end? I think I know the answer to that. 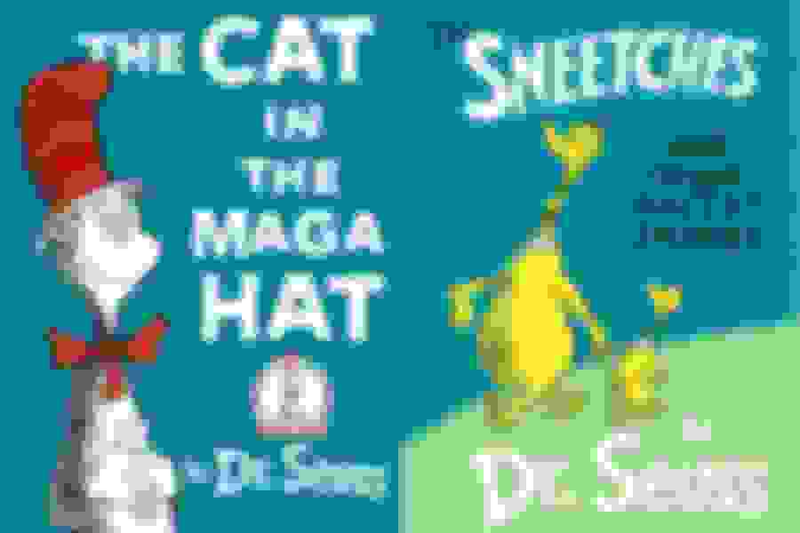 You just know some Masters Liberal Arts student was able to create and get their thesis published by reading Dr. Seuss. Last edited by The Creeper; 03-05-2019 at 08:43 AM. Bull **** material by irrelevant authors. The collection is staying in the grandkids room. The kids like the Grinch movie as much as I dislike carey. Who ever bad mouths Dr Seuss needs to be beaten. Most characters, as illustrated by Seuss are deformed, mildly retarded, and have personality disorders. I doubt folks of color would appreciate being portrayed as that protagonist. Just google "seuss racist images" and you will see plenty. Only if one is looking for it. Get it?? And they were all made by...guess who...not Dr. Seuss. Just once, try thinking before you hit the reply button. Try it. It might hurt the first few times, but that's because your brain is flabbier than Oprah at an AYCE bufffet. I will not read that liberal ****. Like the authors who must've smoked good hash. Liberals declared him racist a while back. I believe that the definition for racist is now, if you're white, you are a racist. Of course if you're family has any southern roots, you're an extreme racist or a racist 2.0, something like that. I think that if you convert to the liberal religion and truly learn to hate yourself, you may be forgiven for being born white. At least it works out that way for the liberal politicians. It must hurt to be triggered all day every day. I guess some people have a mindset of permanent racial victim and are comfortable blaming every other race, color or language for their failure to get along with the rest of the world that doesn't take every little word as a personal insult.